Meet the BizCorps Associates. They’ve come from around the world and studied at some of the world’s top MBA programs– and now they’re contributing to Colombia’s growth and gaining valuable international experience. Their mission: to share their expertise as integral team members of fast growing small and medium enterprises (SME) in Colombia. BizCorps is a nonprofit based in the U.S. and in its second year of operations, operates in two countries: Colombia and Kenya. BizCorps is the brainchild of its founder, Robert Mosbacher, Jr., who is the head of a Houston-based energy company and former president and CEO of the Overseas Private Investment Corporation (OPIC). “At OPIC I encountered lots of SME entrepreneurs who had dreams of growing their businesses in emerging and frontier markets around the world, but did not have the capacity to get it done. In other words, they did not have the right people, systems, and strategic plans necessary to access new markets and attract new capital,” he said. During that same time, the volunteer development organization, the U.S. Peace Corps was marking its 50th anniversary, and Mosbacher thought that it would be great if there were a similar program built around entrepreneurial capitalism. 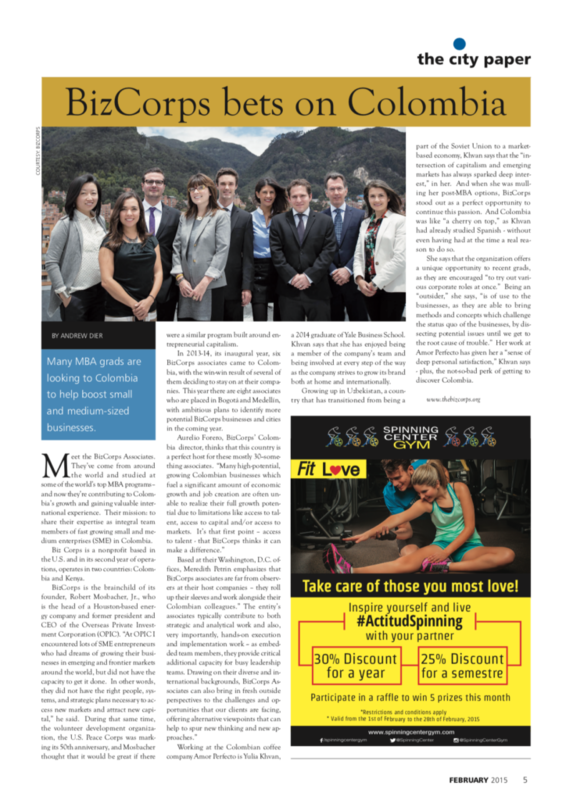 In 2013-14, its inaugural year, six BizCorps associates came to Colombia, with the win-win result of several of them deciding to stay on at their companies. This year there are eight associates who are placed in Bogotá and Medellín, with ambitious plans to identify more potential BizCorps businesses and cities in the coming year. Working at the Colombian coffee company Amor Perfecto is Yulia Khvan, a 2014 graduate of Yale Business School. Khvan says that she has enjoyed being a member of the company’s team and being involved at every step of the way as the company strives to grow its brand both at home and internationally. Growing up in Uzbekistan, a country that has transitioned from being a part of the Soviet Union to a market-based economy, Khvan says that the “intersection of capitalism and emerging markets has always sparked deep interest,” in her. And when she was mulling her post-MBA options, BizCorps stood out as a perfect opportunity to continue this passion. And Colombia was like “a cherry on top,” as Khvan had already studied Spanish – without even having had at the time a real reason to do so. She says that the organization offers a unique opportunity to recent grads, as they are encouraged “to try out various corporate roles at once.” Being an “outsider,” she says, “is of use to the businesses, as they are able to bring methods and concepts which challenge the status quo of the businesses, by dissecting potential issues until we get to the root cause of trouble.” Her work at Amor Perfecto has given her a “sense of deep personal satisfaction,” Khvan says – plus, the not-so-bad perk of getting to discover Colombia. 0 Comments on "BizCorps bets on Colombia"